Originally published under the title "Turkey's Mass Persecution of Christians and Kurds." Entire neighborhoods have disappeared, reduced to rubble. The Surp Giragos Church in Diyarbakır has escaped the fighting relatively intact structurally... But the Turkish security forces have used it as an army base, desecrating the church, burning some of the pews as firewood, with garbage and smell of urine everywhere. Surp Giragos, the largest Armenian church in the Middle East, was damaged during the 1915 Armenian genocide and stood dilapidated until being restored in 2011. The Turkish government seized the property five years later. A similar report, from August 2017, appeared in the Armenian-Turkish weekly Agos. According to the report, "Armenian, Syriac and Chaldean Christians have not been able to worship in their churches for the last three years." This is because virtually the entire town -- and all Christian properties belonging to the indigenous Armenian, Assyrian (Syriac), Chaldean and Protestant communities -- was included in an expropriation plan adopted in March 2016 by the Turkish cabinet. Among the Christian properties expropriated are the Armenian Catholic, the Chaldean Mor Petyun and the Armenian Surp Giragos churches. In response, the Surp Giragos church -- whose members claim that every time they visit, they see that the structure has suffered additional damage -- filed a lawsuit against the Turkish State Council. Other Christian foundations are also engaged in litigation to stop the expropriation, but the suits are still pending. Surp Giragos is the largest Armenian church in the Middle East. According to Agos, its bell tower was destroyed by artillery fire during the 1915 Armenian genocide (at the hands of the Ottoman Empire, precursor to the Turkish Republic), because it stood taller than the minaret of a nearby mosque. After it was expropriated from the Armenian community during the First World War, it was initially used as a cotton storage warehouse. 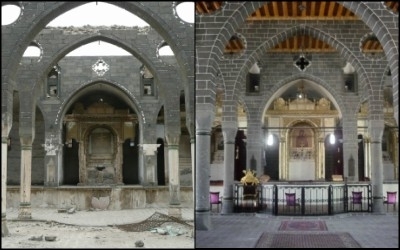 It remained in ruins for nearly a century, until being restored in 2011 and reopened to worship with the support of the Kurdish-administered Diyarbakır municipality. Diyarbakır (originally named Tigranakert) was once ruled by the Armenians and Assyrians. Its most prominent feature, massive black walls that surround the city, were originally built by the Romans, who established a colony there in the third century A.D. When Rome fell, its Greek-speaking eastern realm continued as the Byzantine Empire. Expanding and fortifying the walls, Greek Byzantines tried to defend the city -- as well as the rest of Asia Minor -- from the armies of foreign invaders. Among these were the Persians, the Turks and Arab Muslims, who struggled for regional hegemony during the first expansion of the Islamic Empire in the seventh century, after the death of Muhammed. The Islamic Arab armies won. Khalid Ibn al-Walid, also known as the "Sword of Allah," conquered the city and granted control over it to the Arab Bakr clan, which gave it its current name: Diyar Bakr -- the "place of Bakr," or the "city of the Bakr tribes." The city was then invaded and captured by the Ottoman Turks in 1515. Gültan Kışanak (left) and Fırat Anlı. Among the oldest cities in the world, Diyarbakır is now predominantly Sunni-Muslim and Kurdish. Since 1923, in the wake of the genocide, the Armenians and Assyrians -- the first nations to adopt Christianity -- mostly disappeared from the region. The Kurds have also been persecuted by the Turkish government for decades. 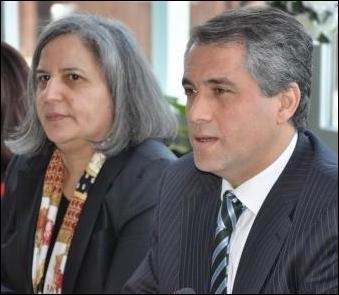 Gültan Kışanak and Fırat Anlı, the co-mayors of Diyarbakır, for example, were arrested on October 30, 2016 for "being members of a terrorist organization," and Turkish authorities then appointed a custodian to run the city. In addition, there are currently 13 Kurdish MPs -- including the leaders of the pro-Kurdish Peoples' Democratic Party (HDP) -- in Turkish jails. Nor was Diyarbakır the only municipality to have been targeted by the Turkish government. In April 2017, the pro-Kurdish Democratic Regions Party (DBP) announced that Ankara had appointed custodians to govern 83 Kurdish-run municipalities, and had imprisoned 89 Kurdish mayors. 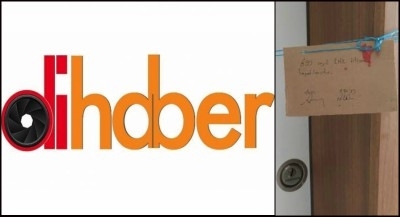 The Kurdish news outlet Dihaber was shut down by governmental decree at the end of August. Yazidis, Alevis and women in the region are also being abused by Turkish authorities, and dozens of Kurdish journalists who have publicized this have been imprisoned. The Kurdish news outlet Dihaber, for example, which has widely covered the devastation of Sur and the persecution of its Christians, was shut down by governmental decree at the end of August. Ahmet Güvener, a pastor and the spiritual leader of the Diyarbakır Protestant Church, said in a recent interview that the anti-Christian practices in Turkey of forced assimilation, community plundering and church-desecration are not new. "We have been exposed to ethnic and religious discrimination for years," he told Dihaber, adding that, since the founding of the Turkish Republic in 1923, not a single church has been erected. "The state, which spends billions [of Turkish liras] and builds gigantic mosques, has not built a church so far," he said. The situation is so acute that anyone who does not shun Christians or Kurds is imperiled. For instance, a 76-year-old Muslim grandmother in Diyarbakır who is active in a Kurdish political movement has been harassed by Turkish police for being a "hidden Armenian," simply because she reads the Bible as well as the Koran. Hatred of Christians and Kurds is widespread both within government and among the public. This hatred of Christians and Kurds in Turkey is not restricted to government officials. It is widespread among the public, as well, and expressed extensively on social media. In response to a tweet by a Kurdish journalist calling for an end to the devastation in Sur, Turkish twitter users not only called him a "vile, treacherous Armenian dog," and "Armenian sperm," who, like all Armenians, "must die," but hailed the destruction of the town for being kafir ("infidel"). This is in keeping with a common term in Turkey used to describe the grandchildren of survivors of the Christian genocide -- "kılıç artığı," or "remnants of the sword." Turkey seems determined to annihilate even the defenseless "remnants of the sword" and whatever is left of their civilization. The situation of minorities in Turkey and their persecution by Turkey -- a member of NATO and perpetual candidate for EU membership -- must be told as often and as loudly as possible.